HINT: President Obama has called for longer school years. Slacker! Just look at all I have accomplished thanks to Affirmative Action on MY part! Yeah, so what if the tower is made of ivory? Look you little Twerp! It's about the teachers and the NEA, not you. You have to realize this is bigger than you. What you have to realize is that their pension plans are at stake and their UNION, and they really really like me. Just shut up and go read that history book your teacher gave you. You know. the one by Howard Zinn. Really smart guy, that Zinn character! I like him a lot!!! I shored up all your teachers zealous pension plans in order to stimulate the gov...I mean the economy. They are very happy now, so remember those teachers are all really really smart. So just listen to everything they have to say, especially about George W. Bush and me. The peasants are revolting you say? Why yes, I find you all revolting! "Say! From way up here, you people look like ants!" 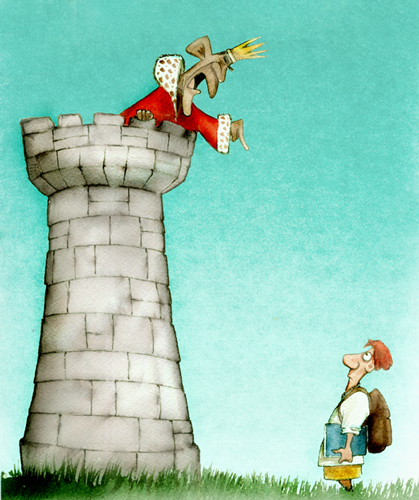 "I'm the King... this is the Rook, and YOU are the Pawn. Now get back to class!" "You see, Timmy, just throwing money at the problem made things got worse. So now we're gonna throw you at it. And money. Hey! Don't touch! That's not for you." "You see, Timmy, education is like the economy: when something's not working, that just means you're not doing enough of it." See what you can accomplish with zero talent and only the ability to lay a guilt trip on someone? "You there , with the backback! I need a caddy this weekend, what's your selective service number?" "I'll sue you if you utter another word about enforcing our moat." "Sure, all men are created equal... I just wish you simps would learn your place & stay in it." This page contains a single entry from the blog posted on September 28, 2010 5:23 PM.